Carmichael plays Ryan, a 12-year-old girl who moves with her father to a tiny California fishing town in order to help her aging grandfather, whom she hasn’t seen since she was very tiny. Even this early in the film, adults who watch with their daughters will be thinking, Really? I mean, if you don’t see someone for 10 years it usually implies that you’re estranged, and yet the only thing that seems strained in their relationship is their insistence on “caring” for the older man and forcing him to take it easy, since apparently his doctor put him on an aspirin regimen for his heart. If you care enough about a relative to relocate, why didn’t you care enough to visit over the past decade? Then too, we’re told the fish left a LONG time ago, but everything in this quaint little town looks freshly painted and picturesque as a thriving tourist destination, not a depressed fishing village. The only remotely ramshackle thing is Grandpa’s boat, which has one panel on the hull that’s been primed but not painted. 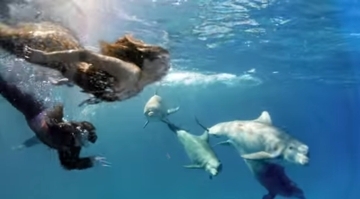 In the early going the plot will remind you a bit of the Flipper remake, in which an isolated boy forced to live someplace different finds a best friend in a dolphin. Only here, Ryan encounters a mermaid named Coral (Sydney Scotia) who had become briefly entangled in a net hanging inexplicably close to the dock. Though she keeps the mermaid business to herself, even more inexplicable is that Grandpa (Barry Bostwick) admonishes her for going to the docks alone. Someone her age shouldn’t be doing that, he and his son chide. Really? I mean, it’s not as if she’s so small she could fall in and drown, and the docks in this quaint little town aren’t exactly full of rough-and-tumble sailors, fishermen, or longshoremen. It’s a pier, basically, with a few boat slips, and an easy walk to cute little bakeries and cafes. Yet, just one day later when Grandpa insists that his son come with him on a two-day fishing trip, he suggests leaving Ryan on her own because “she’s old enough.” That’s not inconsistent at all, right? The point is, if you’re an adult and you think too much, you’ll find plenty to criticize. If you’re a girl in the target age range, you’ll get caught up in the BFF giggling that a young girl and a young mermaid enjoy together. Grandpa blames the mermaids for chasing away the fish and now he’s determined to catch them to bring the fish back, and the queen of the mermaids (yes, there is such a thing) has warned her people to NEVER have contact with humans. So you basically have a situation where both girls are taking a walk on the wild side because they found a best friend—something that will certainly appeal to rule-following and friend-needy adolescents. minutes! I can’t predict how a young audience will react when Coral takes Ryan to mermaid island, but people who saw the old Power Rangers TV series or grew up watching the campy Lost in Space episodes will recognize in the set and costumes an Irwin Allen hokeyness and smile. Try to ignore the continuity error where Coral is still wearing her own necklace in a scene after she and Ryan traded jewelry, or that near the end Ryan’s dad and his old-now-new girlfriend show up on the island, though we have no idea how they got there. Or that we see a Coast Guard cutter bearing down on the island and Dad mentions the Coast Guard, but they never arrive and the scene ends. If you can put aside those inconsistencies and the campy Power Rangers turn that the film suddenly takes, it’s a cute-enough family film. 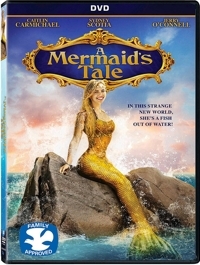 But really, A Mermaid’s Tale—a film that’s as wholesome as can be—is for young girls no older than age 10.